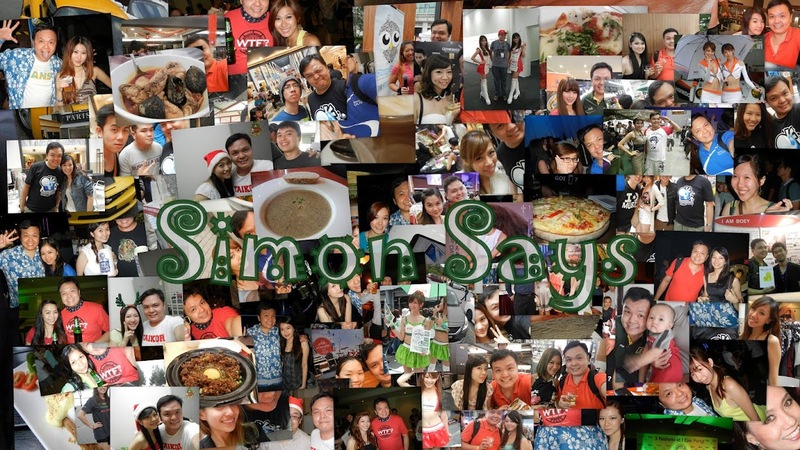 Hello blog. Yes. It's been quite some time I didn't do any new posting on this blog of mine. I have been lazyyyyyyyyyyyyyyyyyyyy. If you miss the food post I wrote, well I do update #foodporn pic frequently on my Instagram. So, click and follow my Instagram. Click! 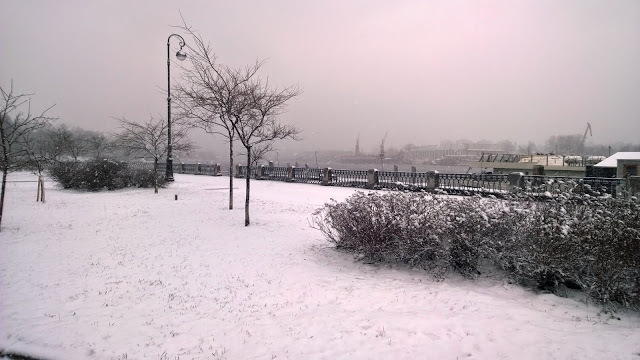 Here's some photos from my trip to St. Petersburg, Russia last year. 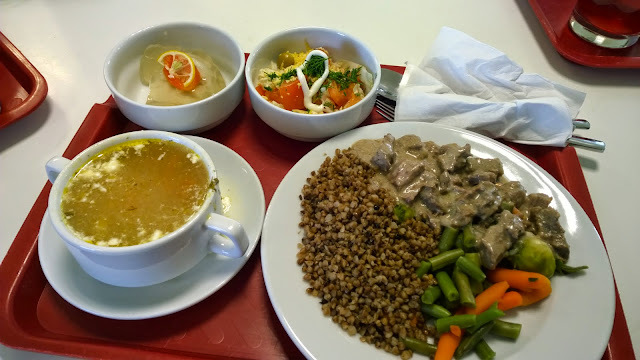 Lunch is nice in my company's factory canteen. The carb here is actually buckwheat, which is in season last year March. Thankfully it's not too cold. Just around -1 - 1 degree Celsius. 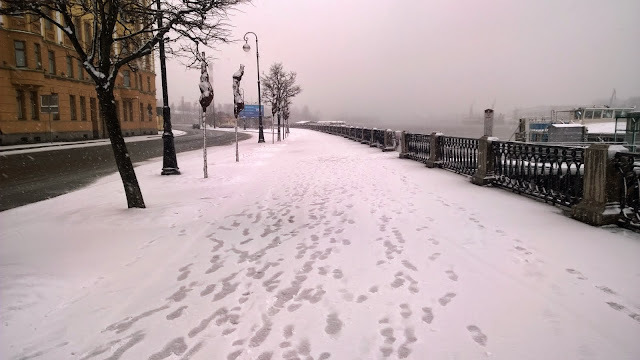 I was warned by my Russian colleague that in 2012 it went as cold as -15 degree Celsius. 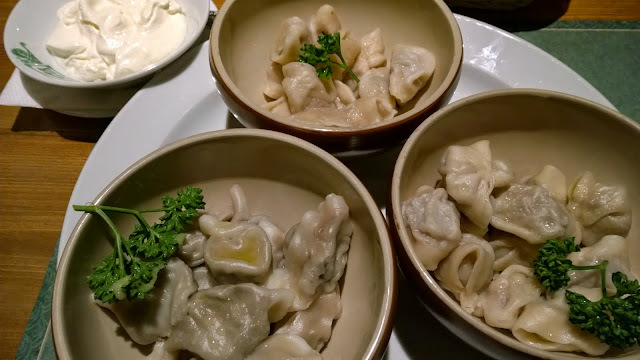 I went to a restaurant specialize in pelmeni (Russian dumpling) the last night I was there. I ordered fillings with beef, chicken liver and salmon. I guessed every culture has their own kind of dumpling dish. 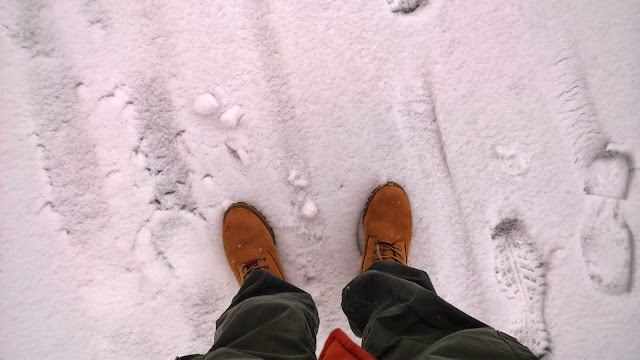 I've never experienced snow before and I thought I could experienced it during my two weeks stay in St. Petersburg but it turned out to be one for warmest March in decade. 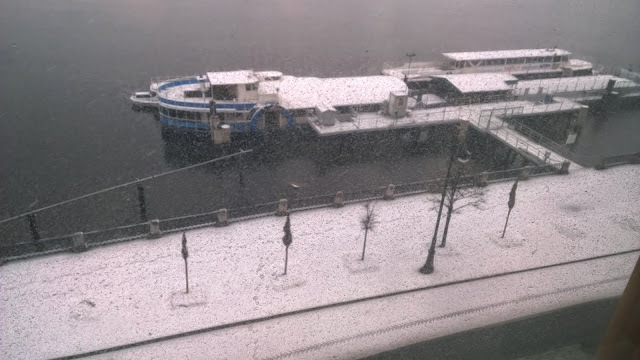 Lucky for me on the day for me to fly back to KL, it snowed! Neva river viewed from my hotel room. Alright. That's all for now. I want to continue playing Magic Duels. Yes, I've taken up the game of Magic the Gathering again where I played briefly when I was in form 5. I promised to post more photos of my St. Petersburg trip in my next post. See ya! 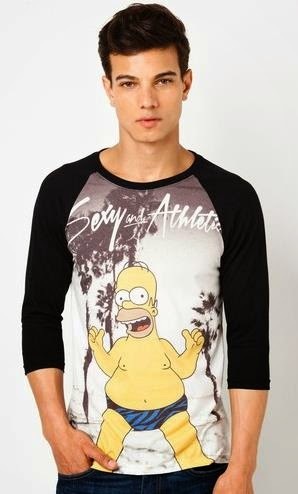 My Favourite Clothing is T-Shirt! I only buy clothes once or twice a year and it's mainly for working attire like long sleeves shirts and slacks. There is one particular type of clothing that I buy almost every quarterly. That's because I wore this type of clothing everyday and at almost any time if the occasion is suitable. Yes. You are right. My favourite clothing that I wear everyday is t-shirt. I wore it when I go out for a movie, I wore it when I am meeting my friends, I wore it while working out and I wore it when I sleep too. It's convenient and comfortable. It's easy to match t-shirt with any other clothing. I can wear it with jeans, khakis, shorts and etc. My favourite style is t-shirt, khakis and sandals, so comfortable and yet not too sloppy. T-shirt also can comes in diffrent colours and prints. I love those t-shirt with a clever quote or picture. Also, prints of my favourite anime or cartoon character or special kind of prints that is collaborating with well known designer/artist/comic blogger. Of course, being a man, shopping is not my forte and going out to a mall to buy t-shirt is a rare occasion. Thank goodness for the invention of Internet and online shopping. Where I can browse the different kind of t-shirts without stepping a foot out of my house. Best of all, I can even compare the pricing of a few online shops to find the best deal. One of the online shopping site for clothing that is currently quite popular in Malaysia is Zalora. Their simple but safe procedures are definitely going to make you feel that you are having the best online retail therapy on their website. 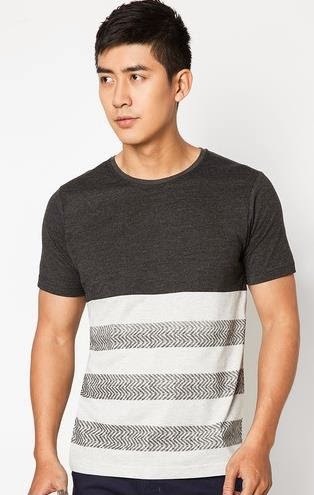 Check out their newest collection of t-shirt for men ranging from top international and local brands at cheap and affordable price! Gillette "Are You a True Brazil Fan?" Winner to be Announced! Gillette® announces the launch of its Limited Edition Brazil Razor featuring the flag of Brazil. Providing the best shaving performance delivered by Gillette’s steel blades, fans and players alike can now show their passion for football during their daily shave. Gillette knows that when it comes to football, nothing else matters. The new Limited Edition Brazil Razors are a daily affirmation of football fans that stand proudly behind their team - wearing their colors on the outside and their inner steel within. From 1st of April to 15th May 2014, football fans can stand a chance to win a once in a lifetime all-expenses paid trip to Brazil for 2 by joining the “Are You a True Brazil Fan?” contest! The contest winner will be flown to Brazil to watch a friendly match between Brazil and Serbia, take in a tour of the Football Museum and experience São Paulo first hand. To participate in the contest, simply purchase a Limited Edition Gillette Brazil Razor (Mach 3 or ProGlide) via Tesco’s e-shop (http://eshop.tesco.com.my/) or in store at your nearest Tesco and submit your entry online at www.tesco.com.my/eShop/Gillette . The contest is held exclusively with Tesco Malaysia. Fahrin Ahmad will be there to announce the winner! Rallying football fans to stand proudly behind team Brazil and participate in the contest is football fanatic and actor Fahrin Ahmad, who is also the President of the Malaysian Artists’ Football Club. Fahrin will be sharing with his fans on social media details of how to participate in the contest as well as giveaways of the limited edition MACH3 and ProGlide Gillette Brazil Razor. The contest winner will be revealed at a prize-giving ceremony at Tesco with Fahrin Ahmad at the end of May. “For Brazil fans, myself included, the Gillette Brazil Razor is a great way to start our mornings, a daily reminder of technical perfection and skill from one of the world’s top football teams and the world leader in the male shaving category. I can’t imagine a more perfect prize for this contest, it is a dream come true for every Brazil fan to watch their team in action. In fact, I wish I could take part!,” enthused Fahrin. Globally, in association with the new limited edition Brazil razor, Gillette has teamed up with one of the most decorated and respected footballers in the world, Lionel “Leo” Messi, to launch the brand’s ‘Inner Steel’ campaign. Showcasing the unrivaled passion and mental toughness required of players and fans to drive their teams to victory and show their passion for the game, Messi will feature in a series of videos documenting the global passion for football. Gillette defines ‘Inner Steel’ as the mental toughness, unshakable resolve and driving will to win. It’s this unfailing courage to go further to perform the best, which is at the heart of the brand’s history and has inspired game-changing innovation, product superiority and enduring success. I'm uses MACH3 razor myself and shaving is so easy and painless. I'll try the Fusion ProGlide soon. “To create our thinnest blades we strengthen our steel to perfection. It is this success from within that Gillette is built on and we believe it is in all men ready to be awakened. Men want the best for their morning shave, particularly as they focus on supporting their teams to victory. That’s why we have combined the best in shave care with the colors that truly matter to both fans and players.” said Ms. Goh Seng Jone, Communications Manager for P&G Malaysia. Gillette® Limited Edition Brazil Razors are available at all leading retailers nationwide for a limited time only. Visit the Gillette Malaysia Facebook page [www.facebook.com/GilletteMalaysia] to view the Inner Steel documentary, find out more about exciting Gillette ‘Inner Steel’ in-store activities near you, and discover how you can win must-have football-themed prizes. Follow Fahrin Ahmad for updates on the Limited Edition MACH3 and ProGlide Gillette Brazil Razors as well as information on the contest to win an all-expenses paid trip to Brazil.